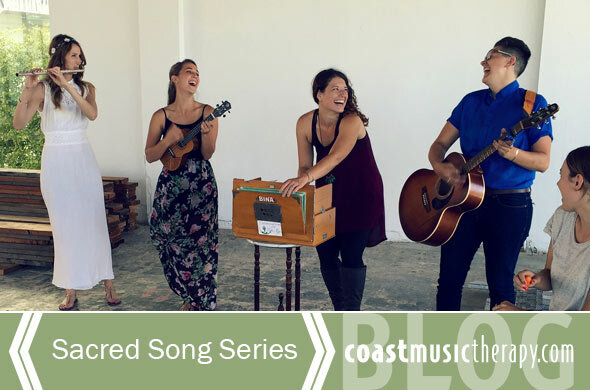 Sita Rose (aka our very own Laura Anderson) teamed up with some of the Coast Music Therapy staff for her July Sacred Song Series. This month’s chant entitled “Open Your Ears” is a direct reflection of the work we do with children who have special needs and the importance of listening to them. When it comes to communication, many of our students express their needs non-verbally or through behaviors. “Open your Ears” is about awakening our senses as therapists, teachers, parents and as a community to effectively listen to our children who do not communicate conventionally. Sacred Song Series is a year long project where different musicians in San Diego gather together to perform live an original chant infused with positivity. A video is released each month to mark the new moon and celebrate our connection to the lunar cycle and nature overall. Laura Anderson (Sita Rose) of Sacred Song Series is thrilled to release July’s chant featuring the talented music therapists of Coast Music Therapy. Thanks to Jordan Guzzardo Video Production for their outstanding production assistance. Subscribe to Sita Rose’s YouTube channel to receive more awesome chants!